Based on a true story and portrayed by one of the famous actors, Mr. Richard Gere, the story of Hachiko is known worldwide. As to my insights on the movie, don't ask. I watched a couple of seconds in it and started to cry for no reason except knowing the gist. "Damnit, the trailer made me cry again!" Hachiko , an Akita dog, is famous for portraying true loyalty to his master. Most of you have probably seen the story starring Gere. In actuality, Hachiko was acquired by a professor named Dr. Eisaburo (Hidesaburō) Ueno. The both of them lived in Ueno's home in the district of Tokyo called Shibuya. Everyday, Hachiko would accompany the professor to the train station for his morning commute and meet him in the afternoon when he comes home to walk together. In May 21, 1925, with a year-and-a-half-old Hachiko waiting at the train station, the professor never came. Dr. Ueno had suffered a stroke in the university and died that day. Since Hachiko was not aware of this, he went to the station every morning and afternoon hoping for his master to come home. He did this unceasingly for 10 years until Hachiko himself passed away on the same spot where they always met. 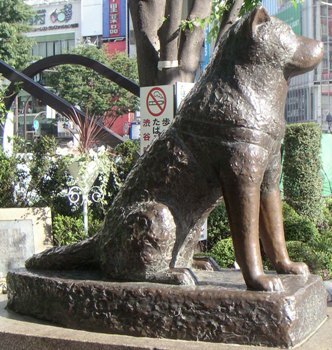 In memory of Hachiko, a bronze statue in his likeness was erected at the Shibuya Train station symbolizing the ultimate loyalty a dog can offer its master. Thanks for letting me know about this movie. It seems like something I'll cry about, too, but I'll try to make an effort to see it.